When in Manila, the saying “laughter is the best medicine” does not suffice for the actual experience of Pinoy comedy. It isn’t just the antidote for weariness or tragedy nor is it the temporary escape from the burdens of work and routine life. The live and actual experience, the slappin’-on-the-table, the kickin’, the pushin’, and the unrestrained jaw-droppin’-laughter turns everything into a whole different kind of comedy because Pinoy comedy is, simply put, real and authentic. Laugh Out Loud with Rex Navarrete and Mike Unson, a two-day comedy night show, was just brought into place last night at Bar 360 in Resorts World Manila. The next one will be at Strumms, Makati on June 4. Laugh out Loud’s show at Bar 360 was comfortably funny in the most expected way. It was set in such a way that the audience got to get a good view of the comedians with a good array of drinks and finger food to enjoy and, of course, there was endless laughter here and there as the hilarity levels went through the roof. Mike Unson, a stand-up Filipino comedian who practices point-of-view (POV) comedy, started the show with a good appetizer of Filipino comedy with his experiential sketches. As random as they seemed, the lines between them were smooth and well-transitioned. His humour never went out of the way. His ability to get through every Pinoy’s humorous sense was simply skillful. Mike is one of those comedians who proves that Filipino comedy is definitely worth one’s time. Rex Navarrete, the master in stand-up Filipino comedy, certainly shook the crowd with his most-awaited set complete with good stomping and slapping because of his hilarious delivery and the randomness of his scenes. The Filipino experience was the core of each of Rex’s comic sketches, making them palatable in every sense. However, above the surface of the comedy, Rex also floated above the rest because of the social, personal, realistic, cultural, and even political themes of his set. Stand-up comedy was the act and medium, hilarity was the fine transition, and the real experiences and current events made the content complete. To Rex, comedians are simply bored, so they observe everything in life and use people’s first-point reactions as subjects for every situation. The most interesting part about his content, though, was his innate Filipino pride. He mentioned the resiliency of Pinoys and made it evident through laughter. He also threw in seemingly random sketches that eventually tied into a smooth whole with scenarios from current events, including Janet Napoles’ predicament to senators’ “professions”. He also made use of a hard Filipino accent to properly accentuate the Filipino experience, so to say. He also came up with a hilarious encounter between his mom and Brian O’Brien, one of his best friends in the U.S. (or so he claims). The lechon sketch was definitely a must-hear, but the rest of his scenes were also hilarious enough to make the whole audience laugh out loud. By incorporating what is relatable to the Filipino, it is safe to say that Rex is the epitome of Filipino stand-up comedy, thanks to his substantial and humorously tasteful delivery. Pinoy comedy is well-layered as dependent on the humorous sense of the audience. It may come as simple as any slapstick show or reflect on real-life experiences with a more substantial and funny twist. Rex Navarrette crafts Filipino comedy by bringing together thought processes that involve current events and life experiences in a comfortable and hilarious manner. Rex is a born natural in stand-up comedy; his long-standing comedy background just backs it all up. What is more interesting about Rex is his embedded and implicit pride in Filipino life and culture. The hilarity and comedy is just his way of delivering that to the people and to make things more palatable. With his comic skills, he will definitely go an even longer way from here. For those watching the June 4 show at Strumms, get a taste of Rex Navarrete’s skits for now through Maritess versus the Superfriends. MANILA THEATER WATCH: Must-See Plays in the Metro for the First Quarter of 2014! 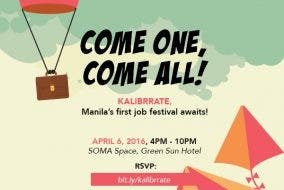 Kalibrrate: Making the Job Hunt Fun in Manila’s First Job Festival!